By Bill Gove. 2006. 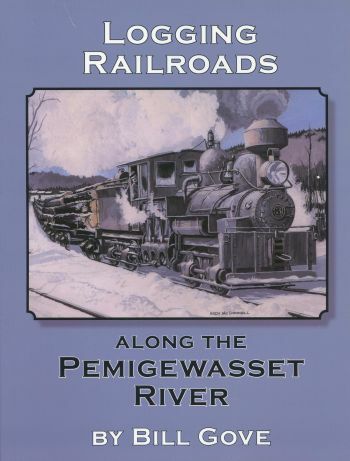 The fascinating story of the golden age of lumbering and railroading in the Pemigewasset River valley in New Hampshire's White Mountains is chronicled in this book by well known historian Bill Gove. Based on more than three decades of research, the book examines the history of the various logging operations that worked the Pemi watershed for a period of nearly 50 years. Among the logging railroad operations covered are the Gordon Pond, Woodstock & Thornton Gore, and Beebe River Railroads, plus the timberland operations of the Johnson Lumber Company, Woodstock Lumber Copmpany, W.D. Veazey and Company, and Parker Young Company. The book also features more than 225 vintage photographs and more than a dozen original maps and charts drawn and compiled by the author.